All children boys and girls 5 to 13 years are expected to have lots of fun, laughter and activities at the successful and ever popular Sport themed Village Festival. Just Play Soccer will be teaming up to deliver a variety of different sporting activities with Rugby, Little Athletics, Netball, Rugby League and Cricket to provide an afternoon of fun while receiving important health messages to improve youngster’s lifestyles. Last month saw an awesome turnout with over 100 kids and so we encourage all parents to organise your kids to come down to the Matavera Field after school where they will be safe, supervised and active. Just Play Project Manager, Michelle Paiti and Public Health’s Karen Tairea are encouraging our young children to be physically active after school, while also educating them on the importance of nutrition and hydration. Hydration is the Health message for this month and the Ministry of Health will be there to deliver this important message. Water will be provided during the activities but we ask that children wear hats or sun block to keep themselves safe from the sun. 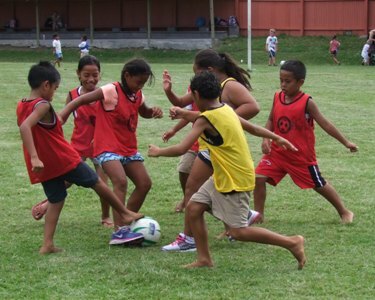 Cook Islands Football through its Just Play Programme has partnered up with the Ministry of Health, Cook Islands Rugby, Cricket, Athletics, Netball and Rugby League to deliver this community initiative and to promote the awareness of non-communicable diseases. The Matavera community and those surrounding villages are encouraged to not miss out on this event for the children. All are most welcome to join in, come down to the Matavera Field and Just Play. “Hopefully the weather will be a little kinder and clear up for us so the children have the opportunity to give a number of sports a go,” says Paiti. Paiti would like to acknowledge Australian Aid for their continued funding of the Just Play Social Development Programme and also thank all our partners in the community initiative.